Like the Grey-crowned Babbler, the Samford valley is one of the few places in South-East Queensland you can see this mud-nesting, gregarious species east of the great Dividing Ranges. Members of Birds Queensland often visit the Wights Mountain area looking for these birds. 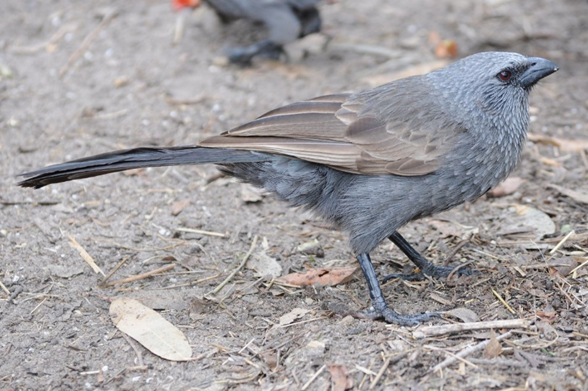 Apostlebirds move around in family groups, up to about a dozen, hence the common name. These birds mainly forage on the ground looking for seeds, but will occasionally probe the bark of trees for insects. Like babblers, they chatter constantly using a range of harsh scratchy and squeaky calls. If disturbed, they will often fly to a nearby tree and scold the intruder loudly. Flight is slow on rounded wings, with lots of gliding. The nest is a large mud bowl, often built on horizontal branches, often of wattles.